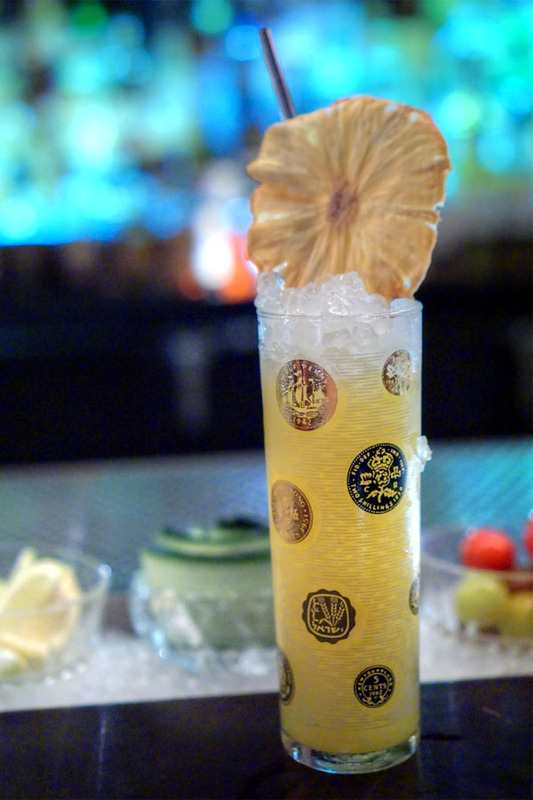 The Walker Inn's newest theme is entitled "A Day/A Night at Sea," a sort of nautical concept. It debuted at the start of June, and follows "Winter Citrus," which lasted about four months. Guiding us through the tasting was Charlotte Porter, a relative newcomer to the bar who's been here for about two months. A SoCal native, she started out at Ballard Inn up near Santa Barbara in 2010 (while attending SBCC), then enrolled at the Culinary Institute of America in 2012. 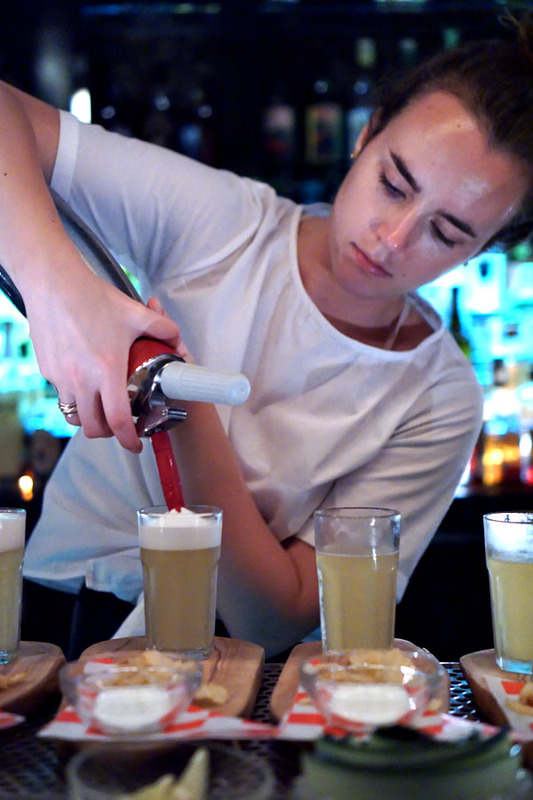 She externed at Momofuku Má Pêche during her tenure there, but upon graduating in 2015, decided to pursue a career behind the bar instead of cooking. She worked at both NoMad and Eleven Madison Park before moving back to LA near the start of 2017. Porter was joined tonight by proprietor Devon Tarby. The new menu's shown above. Since we were at the bar, we had the full cocktail tasting, which was priced at $70 a head for seven courses. Click for larger versions. 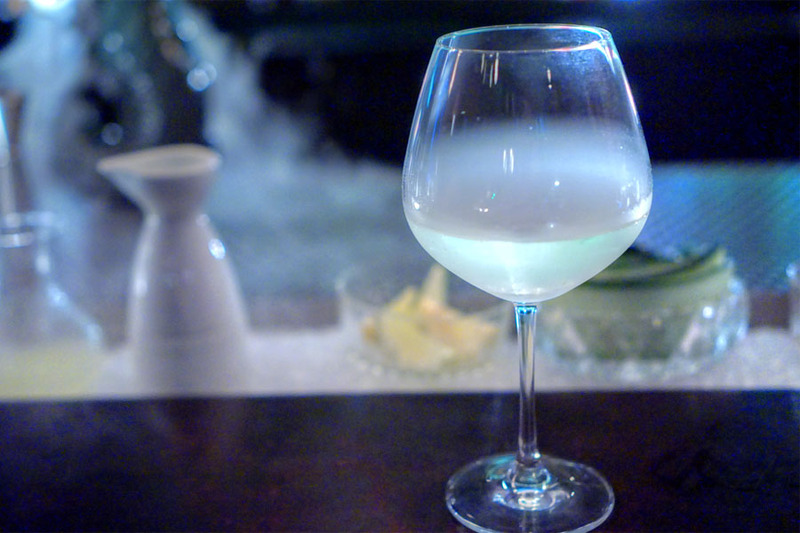 We began with a cocktail designed to recall the cool, calm waters at dawn: a seaweed-infused pear brandy combined with a touch of fino sherry and a cucumber distillate, the whole thing carbonated. It was a memorable start to be sure. 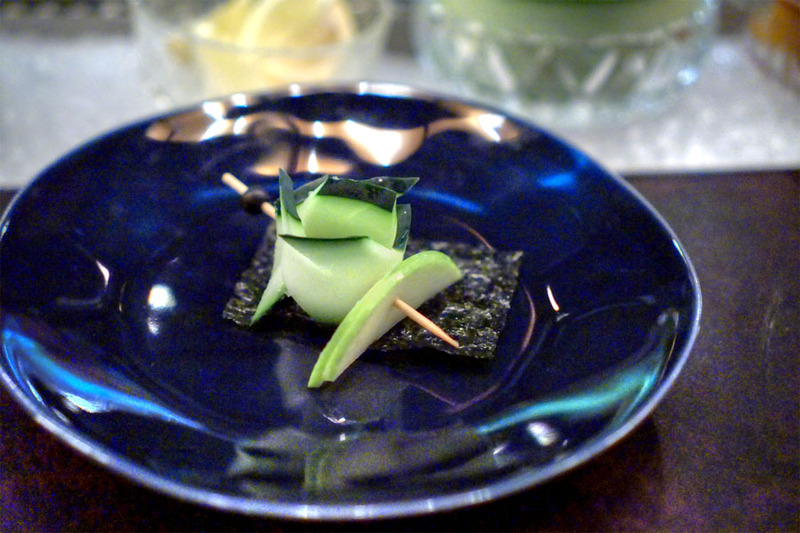 The nose displayed the savoriness of nori at first, backed by a green apple-type sweetness. The taste went in a similar direction, showing off sweet notes of pear and apple before finishing with a marked umami quality. Accompanying was a snack of apple, cucumber, and seaweed, designed to be eaten hand roll style. 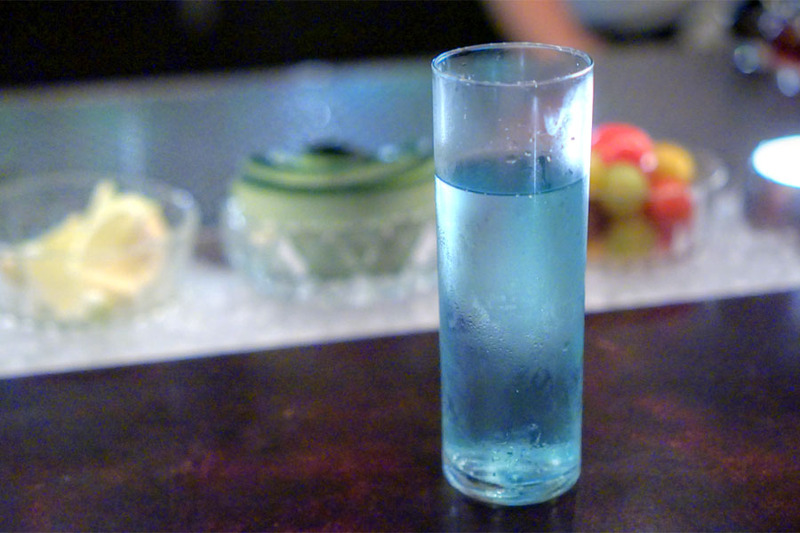 Taken along with the cocktail, it seemed to amplify the drink's inherent sweetness. Porter's favorite cocktail was a sort of liquid breakfast, to provide sustenance before hitting the open waters. A play on the Bloody Mary, it brought together clarified tomato juice, jalapeño-infused vodka, herbs, and a touch of salt. I'm generally not a fan of the classic cocktail, but quite enjoyed this. It had a lighter mouthfeel, a less overt tomato character, and was very well balanced, with a good mix of tart, savory, spicy, and nutty nuances that was surprisingly refreshing. On the side was a tangy, acidic pickled cherry tomato, as well as a crostino with olive oil and a sugary tomato jam made from the solids of the aforementioned tomato juice. One of my drinking companions brought along a snack of Korean crab chips (in three flavors) from producer Binggrae. 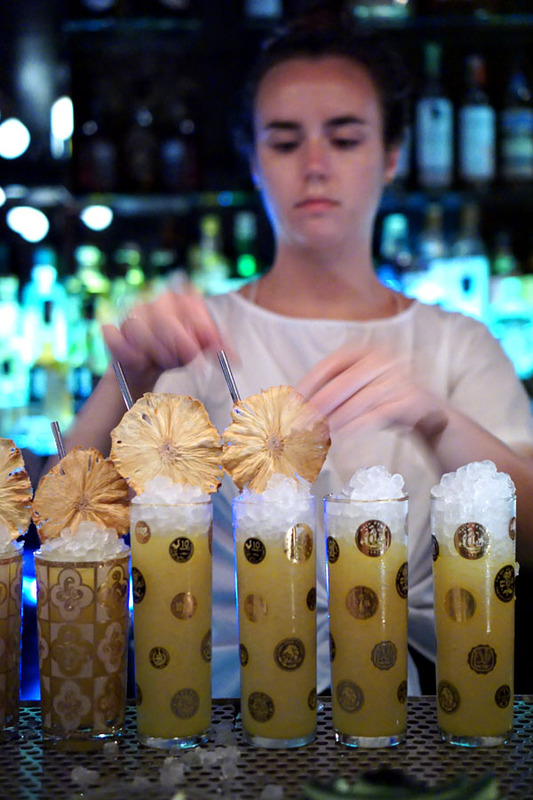 We made sure to share with our bartenders, of course. Next was a cocktail designed to cool you down come noon. 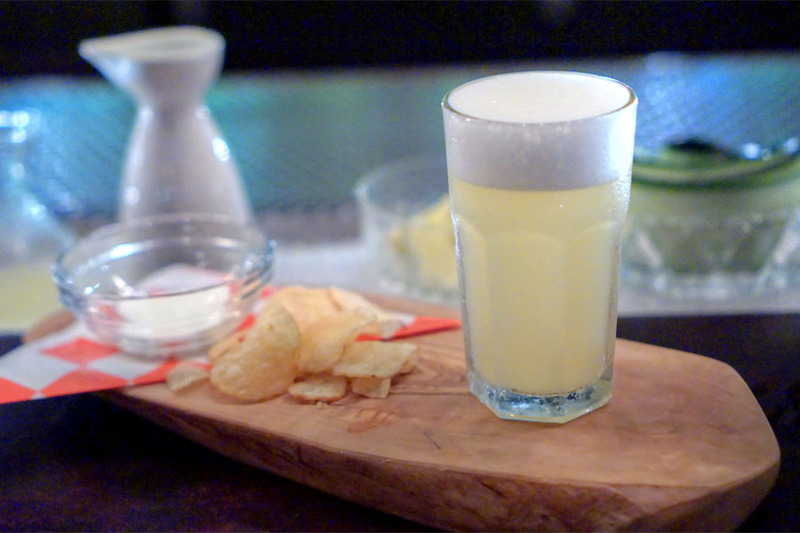 It combined a turmeric-infused tequila with passion fruit, Suze gentian, and a tinge of Lillet Blanc, while garnish duties were handled by a dehydrated pineapple chip. This one was as advertised, delivering rich, sweet-tart pineapple and passion fruit flavors with nary any booze and just a whisper of bitterness. 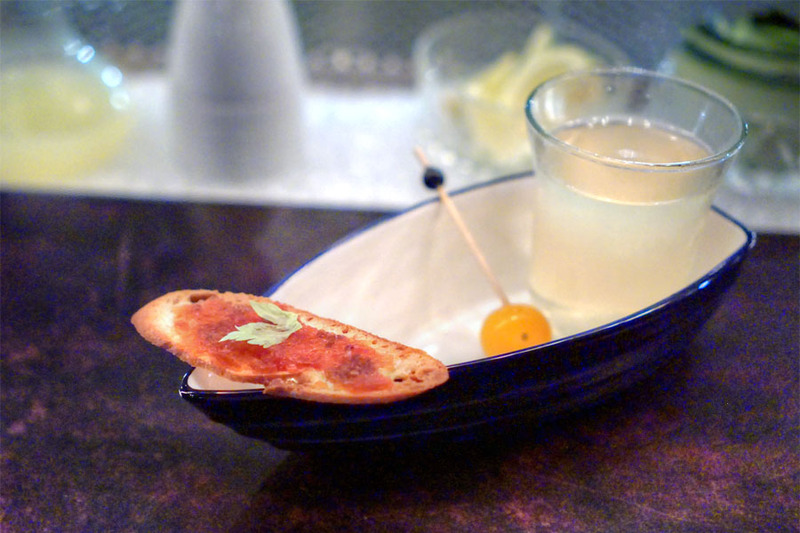 While fishing, often times a beer and a snack are called for, hence this next cocktail. 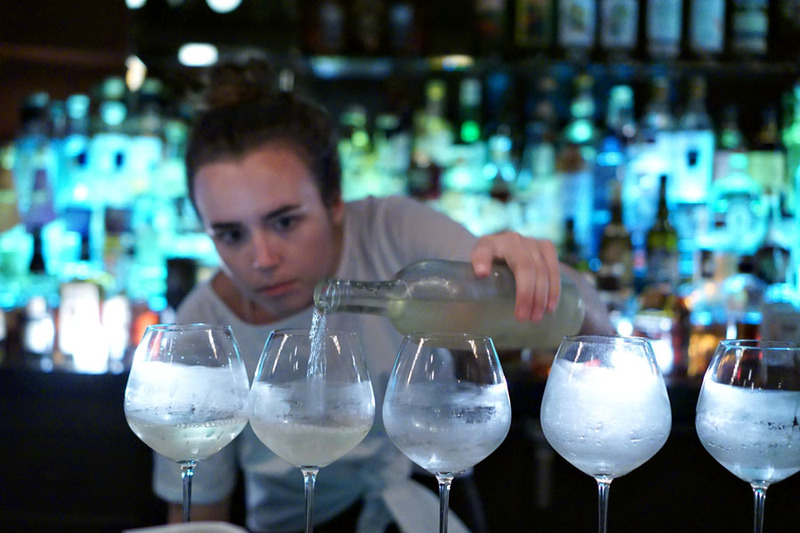 It was a mix of an American cider and a French cidre, along with a grapefruit cordial and clarified grapefruit juice, topped with a foam of egg white, lemon, and more grapefruit. I found it a refreshing drink with a good mix of sweet apple and sour citrus, backed by just a smidgen of barnyard. The chips, meanwhile, were on point, and tasted like fancy "sour cream and onion" when combined with the dip. Lovely. 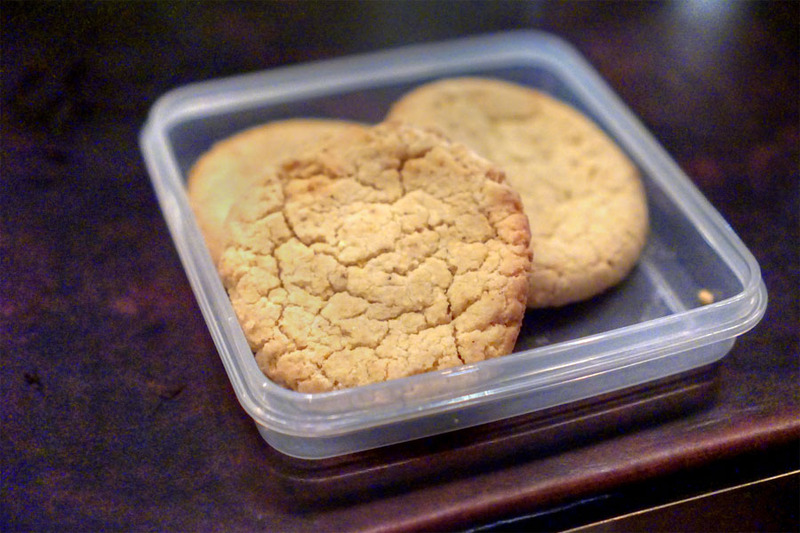 Another drinking companion brought along some homemade Momofuku Milk Bar corn cookies, which we also made sure to share. This cocktail went in a more contemplative direction. The Vinho Verde gave it a light, refreshing, fruity, floral nature, but layered on top from the eucalyptus and matcha "smoke" were very piney, herbal, menthol-y traits. One of my drinking companions likened the experience to baijiu with its "odd sweetness," while another found it reminiscent of Tiger Balm. 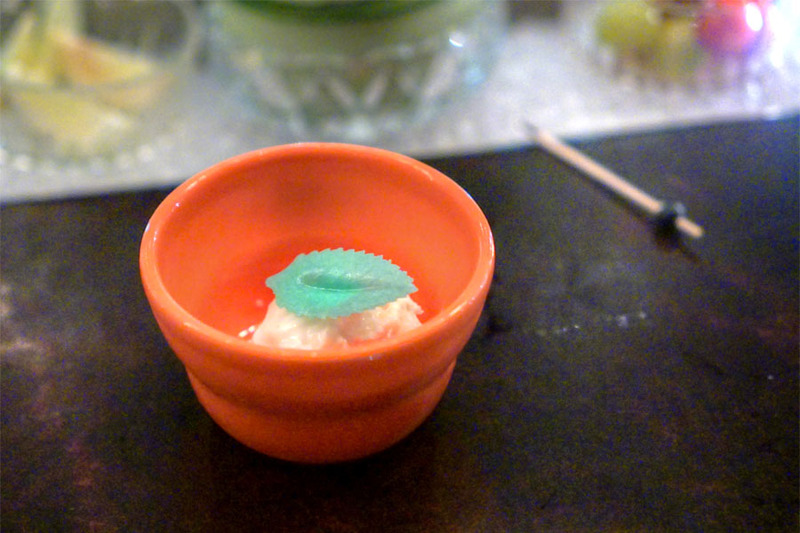 Here we had a palate cleanser inspired by the green flashes on the horizon that one sometimes encounters near sunset. 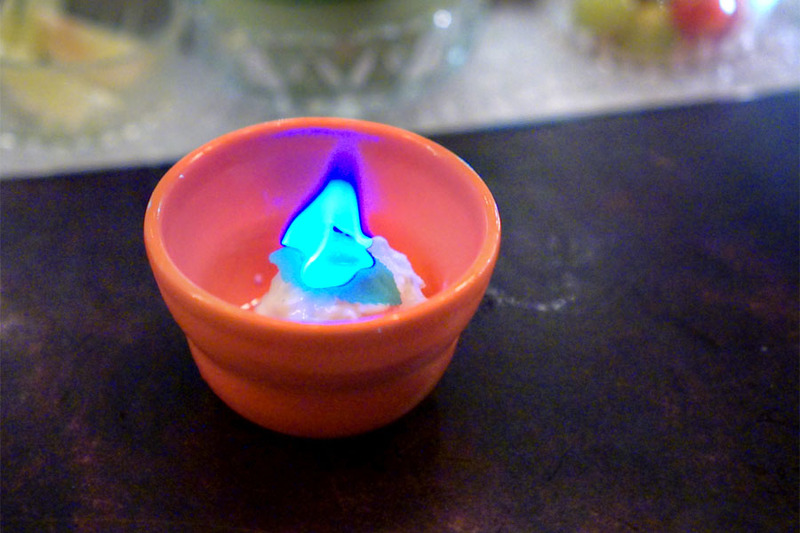 It was a Midori-coconut-basil ice cream with an alcohol-soaked mint leaf that we were instructed to set on fire. The ice cream itself was superb, coming out creamy and sweet, with plenty of coconut and just a trace of booze. The leaf, meanwhile, had a sharp, tangy quality that was just bordering on acerbic. We concluded with a cocktail meant to be sipped while looking out at the night sky. It was a Manhattan variation, and one of my favorite drinks of the evening. 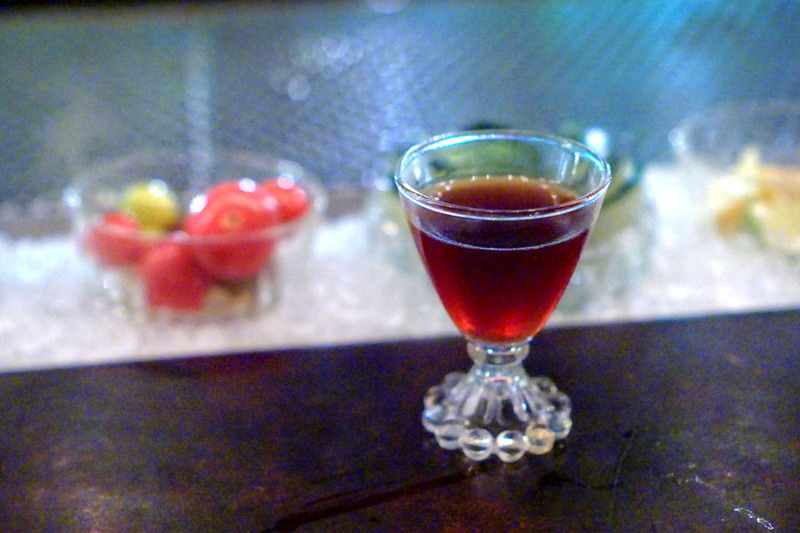 A spicy, dark fruit-filled base of Rittenhouse and butterscotch-infused genever worked wonders, and made for the perfect complement to the bittersweetness of the amaro and bright, minty flavors of the Branca Menta. A fitting close. 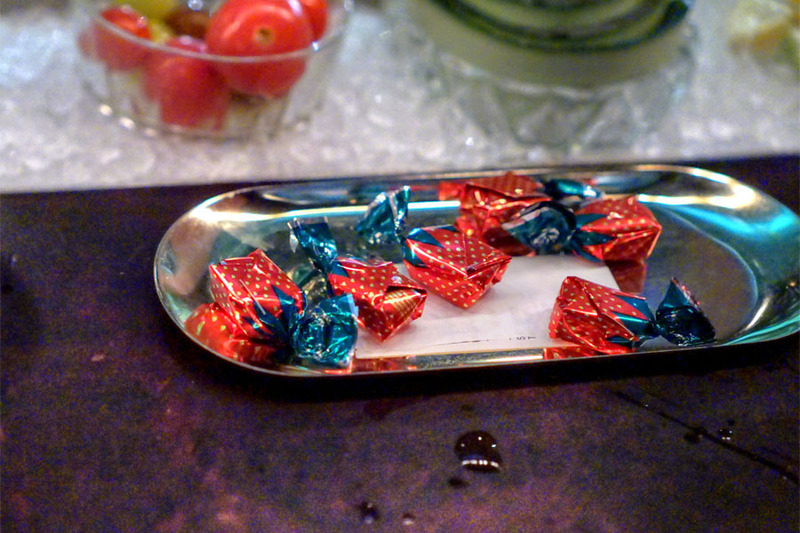 Old school strawberry candies accompanied the bill. Not surprisingly, this was another fun, interesting, delicious menu from the folks at The Walker Inn. Porter looks to be a great addition to the team, and hopefully we'll be seeing more from her. Prior to our cocktail experience, we made sure to fill our bellies at Yup Dduk LA (abbreviated from the full name of Dongdaemun Yeobgitteogbokki) across the street. 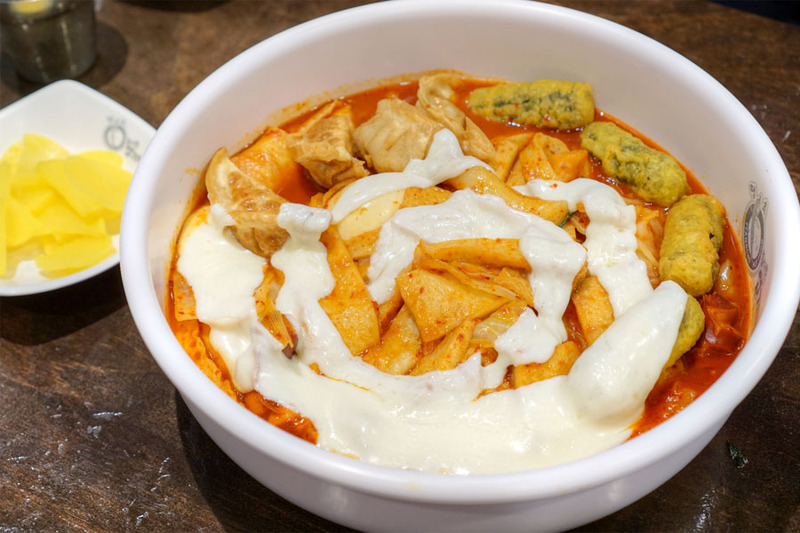 The place opened in October 2015, and is the third US outpost of a Korean chain (420+ locations) of tteokbokki restaurants founded in 2002. 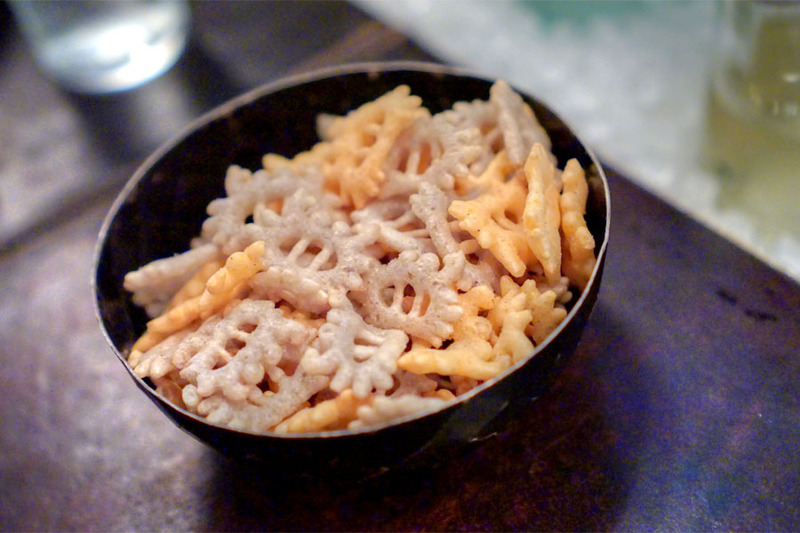 We tend to prefer eomuk to rice cakes, and thus went for the Yup O, which is short for Yeobgi Odeng. The restaurant is known for its extreme heat levels, so we opted for the mildest variant. I found it sufficiently spicy, and it was just enough to make me glisten, with the gochujang always present, but never overpowering. The rice cakes themselves had the right amount of chew to 'em, and the fish cakes were exactly what you'd want: soft, slightly sweet, slightly briny. I also appreciated the textural variation provided by the mandu and gimmari we added, and the soft, runny eggs were excellent as well. Superbly balanced overall, and one of the tastiest preparations of tteokbokki (or rabokki) I've had. In addition to the danmuji above, the jumbo gimbap also helped temper the heat, and was delicious on its own as well. 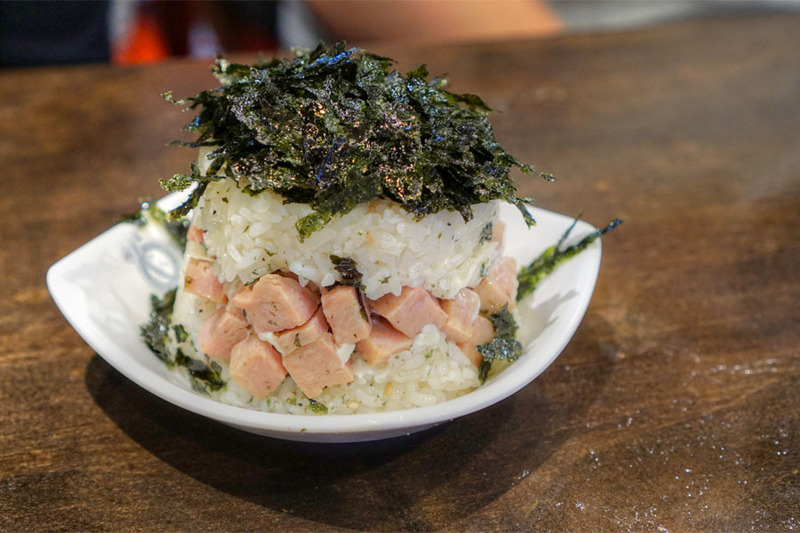 I was a big fan of the creaminess of the mayo here and how that worked with the salty, savory cubes of Spam, all while the seaweed added the requisite umami notes. Very nice. Food looks wack, but the girl made it ok. Such a great and wonderful dishes you are sharing in your post, I like your all making delicious food, It looks very well and I hope it is tasty too.